thank you guys SO MUCH for all your sweet words on my cot quilt, you really know how to make a girl feel all warm and fuzzy inside. it's taken me a long, long time to finally get up the courage to tackle quilting, probably over two years to be honest and now that i've taken the leap, i think i'm hooked. it's so nice to use up some sizable chunks of fabric for a change (and have an excuse to buy more!) and feel like i'm creating something really useful for my home. i've started on quilt number two now, those are some of the blocks you can see in the photo above, and am trying to go larger in manageable steps - this one will be about 1.5m x 2m and be used to cozy up on the couch over winter. i've been using illustrator to work out my patterns and, if you have access to it or another drawing program and want to make up your own quilts, i highly recommend it. i use a 1cm=10cm scale which keeps things pretty simple and it's great to be able to create and move blocks around, try out different combinations, add guides to show quilting options. yep, i'm officially hooked. for anybody out there who is wanting to join me in the plunge but doesn't know where to start, i picked up make your own contemporary quilts and denise schmidt quilts last august and definitely referred to each of them a few times while putting the cot quilt together. i also watched amy karol's machine binding tutorial (so cute) and read the hand binding tutorial in her book. and finally, to make the circles, i simply found a small bowl that was the size of circle i wanted, traced the shape in pencil directly on the fabric (i knew i would be washing it before use and that the pencil would come out completely) and used the pencil line as a stitching guide - easy peasy! Looks great! And nice idea on the use of plates for circles! You are a smart cookie! You've inspired me. 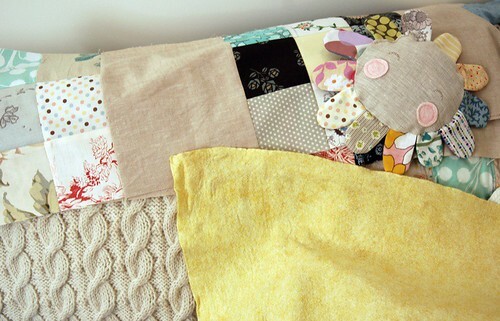 The cot quilt is beautiful, and the next project looks fantastic. I have collected quite a collection of fabrics, but been to scared to take the plunge. You've inspired me and given me a little nudge. I don't think it will be too long before I take a deep breath and go for it - my very first foray into quilting! Both of your quilts are gorgeous! Thank you for the tips on books and resources. The only quilt I ever made was for Ava and I used MS Excel to plan it out (such a dork, I know), but I think illustrator is the way to go! I took the quilting plunge just before I had my first child (5.5 years ago) and I love it so much. It will be a life long skill to keep me busy. I also took some basic quilting/patchwork classes in the beginning. The quilt I made wasn't me at all, but the skills and tricks I learnt from the teachers have been so beneficial. Highly recommend you try to do one. Or you could swap some of your skills with someone who knows how to quilt and lives near you. can't wait to see some more yummy quilts from you. hi leslie.. just wanted to let you know that my blog site has changed to sophik.blogspot.com. happy quilting to you!..